The English Language Center runs two types of courses: General English courses for students in the Foundation year, and courses for students in Post Foundation, which are designed in a broad way to be support courses for the majors they are studying. In addition, the ELC has facilities that students at NCT are welcome to use at any stage of their studies and also offers extra-curricular activities which we encourage the students to take part in. The ELC is also keen that teachers both enjoy working at the ELC and feel that they are getting a chance to develop professionally. To that end we organize a number of activities over the year and encourage lectures and workshops to keep us abreast of current trends in linguistic research or teaching methodology. English Language Center (ELC) of Nizwa College of Technology is dedicated to teaching English as a second language to Omani nationals. The center offers two programs: the Foundation Programme and Post Foundation Courses. ELC is supported by 90+ trained and dedicated teachers drawn from different continents who provide individual assistance to students. The Center is equipped with the following facilities which make learning an exciting experience: computer / multimedia laboratories, a self-access center, conference room and internet / intranet facilities.  help students to gain effective command of the required skills in English Language, Mathematics and Information Technology.  provide realistic learning opportunities for students to speak, listen to, read and write social, workplace and academic English confidently and effectively.  provide a solid foundation in English, Mathematics, and Information Technology to allow students to perform successfully in a variety of academic programs at a higher level.  equip students with the skills and attitudes to successfully participate in lifelong learning in their academic programs and future careers.  develop social competence by helping students to acquire teamwork and decision making skills. Technical Writing 2 is a mandatory 3- credit- hour course offered to first year diploma students from all specializations. The course aims at further improvement of the technical writing skills obtained from Technical Writing 1. It introduces students to different technical writing genres such as recommendation reports, graph interpretation and persuasive essays. Technical Communication is a mandatory 3- credit- hour course offered to second year diploma students from all specializations. The course focuses on improving students’ job search skills such as writing CVs and job application letters. It also equips students with the basics of job interviews. Public Speaking (ENGL3100) Public Speaking is a mandatory 3- credit- hour course offered to advanced diploma students from all specializations. The course aims at improving students’ performance in public speaking and oral communication skills. It covers speech research, preparation, outlining, delivery and evaluation. Students in the foundation program are required to successfully complete the English requirements between one semester and four semesters based on their results in the English Placement Test. There are four Levels in the General Foundation Program and students are expected to study 18 hours of English a week in each Level. A student might be exempted from taking English in the General Foundation Program if they 1) score 71 or above in the English Placement Test and pass the Level 4 exit exam, or 2) get an IELTS score of 4.5 or above. Students who wish to be promoted later to a higher program in their specializations and did not get the required score for that program in Level 4 have to get an IELTS score of 4.5 to be eligible for Advanced Diploma and an IELTS score of 5 to be eligible for Bachelor Degree. They might also take TOFEL and need a score of 500 to be promoted to Advanced Diploma and a score of 550 to be promoted to Bachelor Degree. General Foundation Students are required to meet the math requirements by taking two math courses during their foundation studies. The first course is Basic Math which is common to all students and is normally offered in Level 2.Students might be exempted from taking Basic Math, if they score 15 out 30 in the Math Placement Test. Basic Math covers the following topics: Basic Algebraic operations, Equations and Inequalities, Graphs and Trigonometry. The second math course in the General Foundation Program is Applied/Pure Math which is offered based on students’ specialization. IT, Pharmacy, Applied Science and Engineering students are expected to take Pure Math, while Business studies, Photography and Fashion Design students are expected to take Applied Math. Applied/Pure Math is usually offered in Level 3. Math Courses are taught by staff from the Math Section of the IT department. IT for foundation is one of the mandatory courses in the General Foundation Program. Normally, the course is taken by students when they reach Level 4. A placement test in IT is conducted for all new intake students which will determine if a student should take the IT for Foundation Course or if he/she can be exempted. 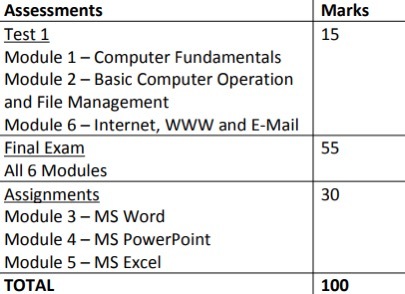 The IT for Foundation consists of 6 modules: Computer Fundamentals, Basic Computer Operation and File Management, Word Processing, Spreadsheets, PowerPoint, and internet and email. The IT for Foundation course is taught by staff from the IT department. 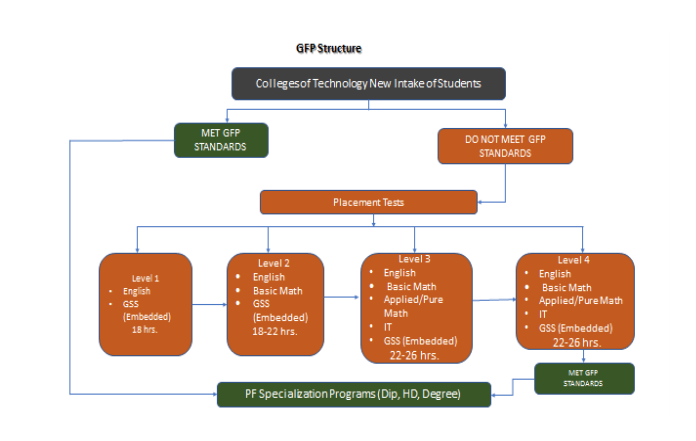 Once students are admitted to Nizwa College of Technology, they have to sit for placement tests in English, Math and IT to determine their level in the three GFP requirements.  76-100: Sit for L4 Exit Exam. If pass, join specialization after completing Math and IT requirements. The decision whether a student is going to take Math or IT courses is also determined by their performance in the Math and IT placement test. The placement tests are common to all Colleges of Technology and are administered online in Nizwa College of Technology. 1) Score 25 or above out of 50 in the Level Exit Exam. 2) Get a score of 50 or above after adding the CA mark to the LEE mark. 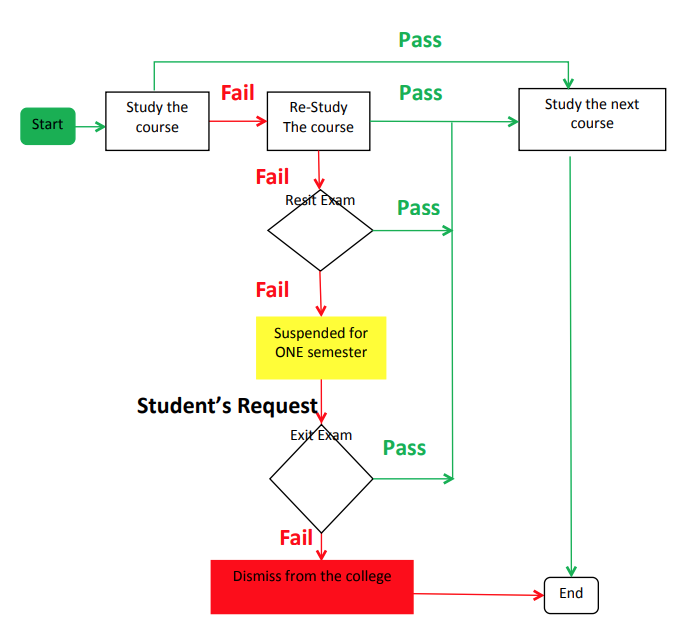 If a student does not meet the above two criteria, he/she will fail and has to repeat the level. If a student fails twice in the same Level or in two different Levels, he/she will be suspended for one academic year (three semesters) and will have only one chance to sit for the Level 4 exit exam and pass by at least 50% to be re-admitted. A suspended student might also take IELTS and get a score of 4.5 or TOEFL and get a score of 500 to be re-admitted. GFP students have to score a total of 50 or above to pass any of the math or IT courses. Basic Math is a prerequisite to Applied/Pure Math. If a student fails in any of the math or IT courses, he/she will be allowed to repeat the course. If he/she fails again, he/she will be allowed to sit for a re-sit exam and if he/she fails in the re-sit exam, he will be suspended for one academic semester. By the end of the semester the student has to appear for a re-sit exam. If he/she passes, he/she will be allowed to continue his/her studies. The student will be dismissed from college, if he/she fails the re-sit exam. The Self-Access Center is a facility at the ELC to offer classified English language learning resources to Foundation and Post Foundation students to foster independent learning among them. It is equipped with a variety of resources like books, newspapers and journals. There are bilingual and monolingual dictionaries, story books, newspapers, reference books to help students prepare for English Language proficiency tests like IELTS and TOEFL and ELT reference books for teachers. In addition, it contains photocopied exercises with answer keys and past exam papers which help students to practice and test their language skills at their own pace in their free time. In keeping with the times, the SAC is a digital center today including computers with internet connection to match the preferred mode of learning of foundation students who belong to the generation of digital natives. Students benefit a great deal by being able to access the innumerable language learning resources available on the internet. To familiarize students with e-learning technologies, the e-version of the Listening and Reading books used at the ELC are installed on all the computers in the SAC. These resources, which are used by teachers in the classrooms, are at the disposal of students in the SAC. This facility allows them unlimited access to materials which interest them but have a limited access to in their classrooms. It allows students freedom for repeated practice and reinforcement of the language components learnt in classrooms. The objective of the SAC is to provide students with an open facility with print, digital and online learning resources to motivate and facilitate them to take responsibility for their own learning and to increase their ability to work autonomously. The SAC allows students to learn at their own pace with classified materials suitable for different levels of language made available to them all through the working hours of the ELC. The SAC has two service desks which provide necessary guidance to students to make good use of the facility. The ELC houses 6 multimedia labs which serve as classrooms for the IT for Foundation courses. They double as language labs to offer Foundation students another digital, autonomous learning facility to improve their skills using computer and internet technologies. Each of these labs is equipped with computers with internet connection, projectors, audio system and smart boards which facilitate modern multimedia teaching and learning. The ELC uses two Learning Management Systems (LMS): Moodle and MyELT. They serve as platforms for students and teachers to communicate, share resources and engage in learning and revision activities. The labs provide students with computers and unrestricted WiFi connection to use these educational platforms and other internet resources for learning. In addition, the e-version of the Listening and Reading textbooks are installed on all the computers in the labs to motivate students to make full use of their textbooks by offering them in the form preferred by the digital native generation of students. Foundation and Post foundation students have free access to the labs when there are no lectures in the labs. A technician is posted at the ELC to maintain all the e-learning facilities and to offer technological help and support to students and teachers at the Center. The Math Helping Center is available to all students in the college. Each semester the Math Section announces timings and venues for students who wish to get any kind of help in Math. The Math Helping Center is not limited to helping students who need help only in their courses, but it also provides assistance to students who wish to learn more about other mathematical issues that are not discussed in the classroom. ALKinany,T. 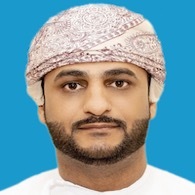 (2018) Measuring the Phonetic Distance between Omani Arabic and RP. English: A PhoneticPedagogical Study. A paper presented in the "International Postgraduate Conference on Research in Education" in Malaysia.